There are 234 employees in Public Works’ Roads & Drainage Division, which has an annual budget totaling $78 million. About $1 million is expended on roadway resurfacing projects that are implemented by the County’s in-house paving crew. The in-house crew is comprised of 24 crew members who are responsible for asphalt resurfacing, and roadway base and shoulder repairs. The crucial part of the County-wide roadway resurfacing program is roadway assessment, inspection, maintenance and new construction. The Roads and Drainage Division utilizes a combination of methods to complete these tasks. One of the components is the use of the microPAVER program (computer software that was developed by the U.S. Army Corps of Engineers) to run a Pavement Management System. In the Pavement Management System, vehicles equipped with high-definition cameras and computers travel the County roadways to capture images of the roadway segments. The comprehensive database contains current and historical information on pavement condition, pavement structure and traffic conditions. The second component to the system is a set of tools that allows Public Works to determine existing and future pavement conditions, predict financial needs and identify and prioritize pavement preservation projects. The County’s in-house staff also physically drives each roadway to inspect and assess roadway conditions for safety and drivability. With the Pavement Management System program, County roadways are rated with scores between 0 and 100 – with 100 being the highest rating. When a roadway falls into the low 70s range, the Roads & Drainage crew evaluates it on-site and implements the roadway’s rehabilitation depending on the history and most viable options available. The roadways that are selected for resurfacing are scheduled “as needed” depending on the availability of funds. “Orange County is the leader in the state of Florida for roadways and over the years, we have developed some of the best methods,” Morgan said. The Division has received top awards from the Asphalt Recycling & Reclaiming Association (ARRA), including the Quality in Construction award for excellence in asphalt pavement for resurfacing (2014); and the ARRA Award for Excellence for Hot-in-Place Recycling (2012). In 2007, the Division received, the National Association of Counties and National Association of County Information Officers Superior award for the Roadway Rehabilitation Program. Cold-in-Place Recycling – A process that removes a portion of an existing asphalt pavement by milling and then replaces it with reworked asphalt mixed with additives. This method is used for severely distressed pavement. Hot-in-Place Recycling – This is an onsite, in-place method to recycle the surface layer of an existing asphalt roadway and replace it a layer of new asphalt material on to the rehabilitated surface in a continuous train process in a single pass. This recycling discipline provides a low-cost maintenance strategy for removing cracks, ruts and low areas by utilizing existing asphalt pavement for in-place rehabilitation. 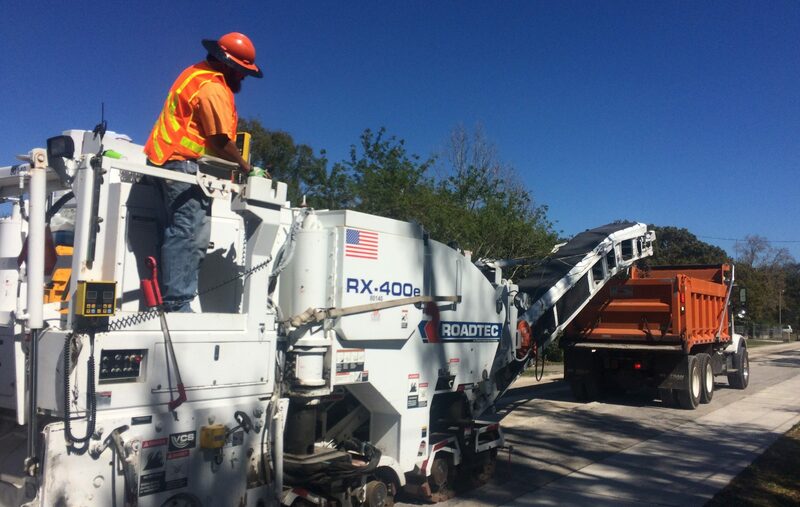 Mill-and-Overlay – This is the most common method that Orange County uses and it removes about the top two inches of asphalt to provide a new wearing surface on asphalt pavement. Coordination for paving is one of the most time-consuming parts of the job because it requires detailed project management. Interestingly, asphalt heats up to 330 degrees Fahrenheit, but can be driven on immediately. “We are very proud of our roadways throughout the County because many are aesthetically pleasing and we take great pride in keeping them well maintained,” Morgan said. He added that it can be confusing for citizens to know which roadways are maintained by the County and which are maintained by the Florida Department of Transportation, but citizens may call 3-1-1, visit www.ocfl.net/311 or download the free OCFL 311 App to report any roadway areas for concern or provide suggestions.